Amazon India users should brace for a bit of bad news. The e-tailer is about to hike the price of its premium service, Amazon Prime from Rs. 499 to Rs. 999 soon. We are not sure when it will happen, but according to a banner on the website, it looks like it may happen soon. Prime members enjoy Free fast delivery, unlimited video streaming, exclusive access to deals & more. Join Prime today at the special introductory price of ₹ 999 ₹ 499/year. Offer ends soon. Amazon Prime is definitely worth the money. Why? Besides guaranteed free one day, two day and standard delivery, Amazon also offers special deals for Prime members. And you also get early access to deals on Sale events such as the Amazon Great Indian Shopping Festival which is held frequently. You also get access to Amazon Prime Video where you can watch Indian movies in many regional languages, English movies from Hollywood, US TV Shows, and Amazon Original Series, all of which can be streamed on your PC, Laptop, smart TV, iOS or Android device. We do not know how long it will be before the price of Amazon Prime is increased, but it can’t possibly happen until 8th October. They wouldn’t raise the price with a sale on, at least that’s my guess. 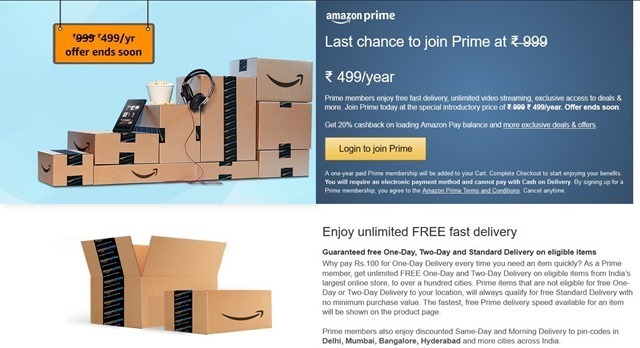 Amazon Prime price to be hiked in India.